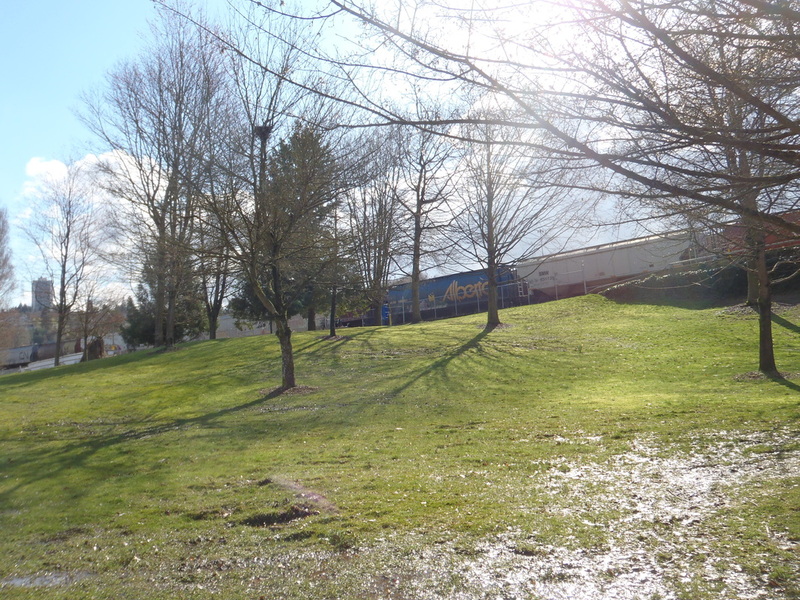 New Brighton Park, formerly known as Hastings Townsite, is situated on the northeastern tip of the humble Vancouver neighborhood of Hastings Sunrise. 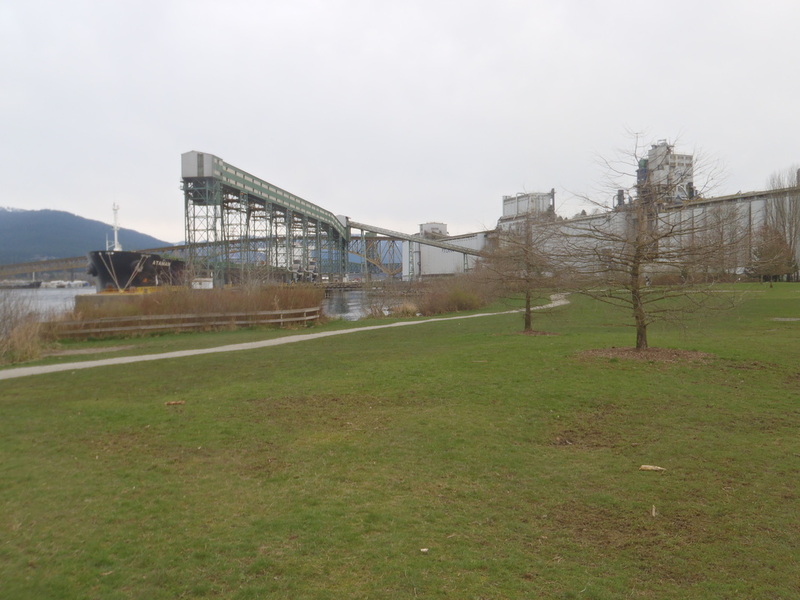 Located on the south shore of Burrard Inlet, just west of the municipality of Burnaby. Today it is a multi use park consisting of ocean front beaches, playgrounds, picnic areas, a soccer field, off–leash dog areas, a concession, public washrooms, and an outdoor public swimming pool that was originally made in 1934 and rebuilt in 1973. Long before current New Brighton Park, from over 3000 years ago until the 1850’s New Brighton and its surrounding area was referred to as “Khanahmoot” by the local Squamish and Tsleil’waututh people, and was a place known for its abundant natural resources of shellfish, large cedars and hemlocks, cranberries, and bears. The events that lead to the current state of New Brighton Park began during the establishment of New Westminster in 1859, when Col. Moody had a rough trail built from New Westminster to Burrard Inlet; the northern half of the trail was an old native trail that linked Burrard Inlet to the rich berry grounds around Burnaby Lake. The trail was named North Road and was built to provide access to a second harbor if New Westminster was attacked or if the Fraser River freezes over; the Fraser River did freeze for 3 months in the winter of 1861 and North Road was used as an alternate supply route to New Westminster form the ice-free Burrard Inlet. After the road proves useful, sometime between 1861 and 1863 the colonial government with ideas of a future townsite reserved the land from modern Boundary Road to Nanaimo Street, and from the south shore of Burrard Inlet where the North Road ended to modern 29th Avenue. 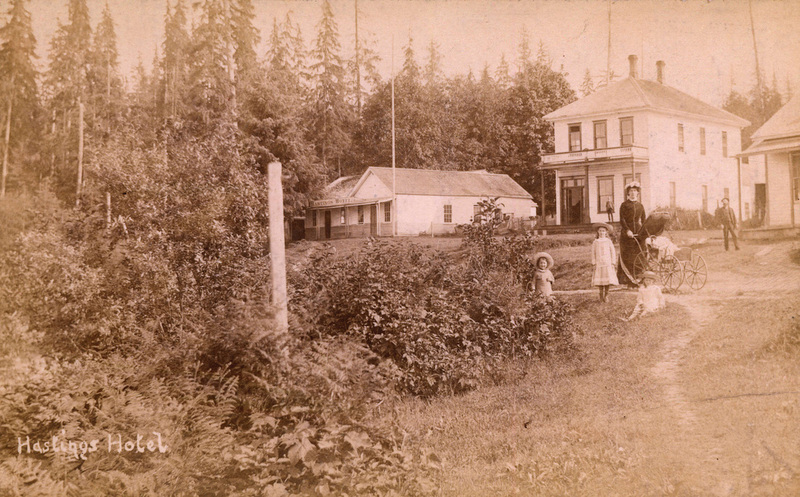 In 1865 North Road was formally rebuilt and it considered the first true road of what will be modern Vancouver; renamed Douglas Road it provided easier access to Burrard Inlet. In august of the same year, Oliver Hocking and Fred Houston open the single-level Brighton Hotel and an associated floating wharf, located at the end of Douglas Road on the Burrard Inlet. Navvy Jack Thomas begins to operate a rowboat service that will take passengers between the Brighton Hotel, Moody’s mill on the north side of the inlet, and Stamp’s mill near modern Gastown. 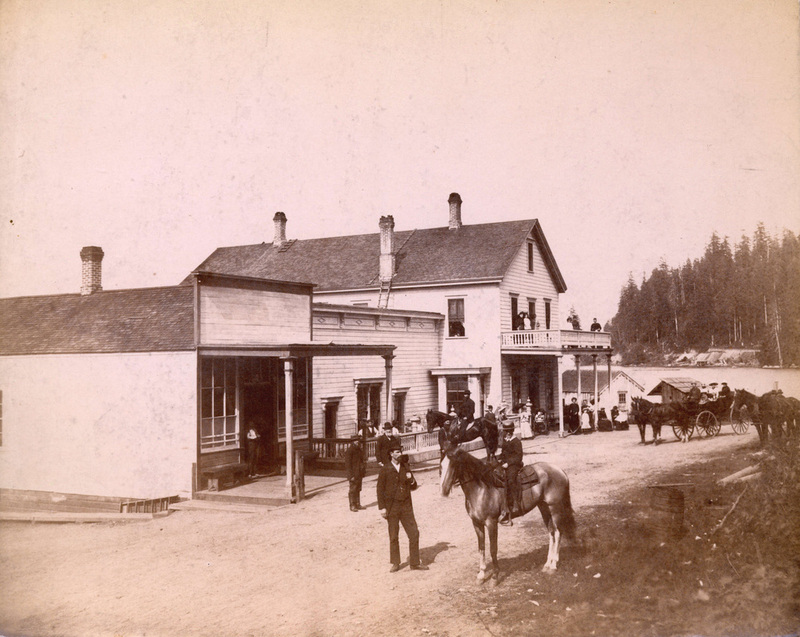 Oliver Hocking, part owner of the Brighton hotel is made a customs officer out of New Brighton in 1866, the customs office makes it possible for ships to leave from the Burrard Inlet without having to go to New Westminster. The next year in 1867 Captain Van Bramer’s steam ferry begins to operate along the rowboat route and a daily stagecoach begins taking passengers between New Westminster and what is then known as New Brighton. In 1869, owners of the Brighton hotel sell their business to Maximilien Michaud who renames the hotel, the “Hastings Hotel” (fig.1.a) but it will be informally referred to as “Maxie’s”. Oliver Hocking becomes Hastings Townsites first postmaster in May 1869. 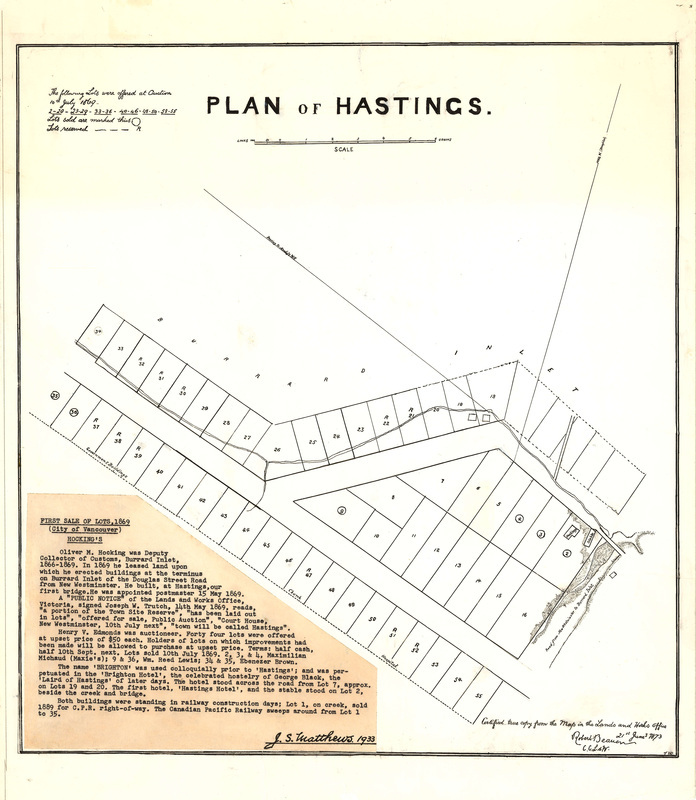 In 1869 the New Brighton area is officially named Hastings Townsite, after rear admiral Hastings of the Pacific Squadron and the first auction for land in Hastings Townsite takes place in New Westminster and seven lots are sold (fig.2). Months after the first auction, George Black purchases waterfront property on which he will build a home, a bar and dining room, and store and later a two-storey hotel which he will name “Brighton Hotel” (fig.3). That same year, Hastings Townsite receives the first telegraph message from Moody’s Mill across the inlet and the message is passed on to New Westminster. A road begins to form in 1876 between the Granville/Gastown area and Hastings Townsite, it is initially only passable by horses but is fully completed in 1877 and wagons are able to easily go between the two townsites. The new road established close ties between Granville and Hastings, and in an 1881 census together they are considered as one town; the census counts 190 jobholders, it does not include wives, children, Chinese, Indians, or prostitutes. 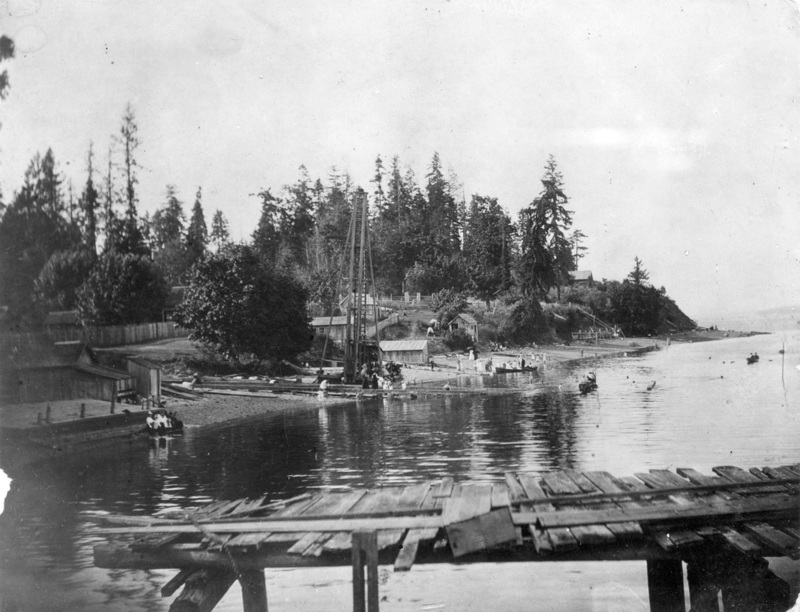 The 1880’s could be considered the boom time of Hastings Townsite as wealthy visitors from New Westminster flocked to the mosquito-free swimming area on a daily basis. An excerpt from an 1886 newspaper claims the Hastings swimming area as “the most fashionable watering place in British Columbia”. Wealthy visitors to Hastings recall the town as being a very jovial place in the summer when it attracted the most tourists, visitors report “loafing around, bathing, and boating” (fig.4).The Brighton Hotel and the Hastings Hotel saw their peak business during these years. Maximillien Michaud’s Hastings Hotel, known as Maxie’s was most popular for its large dance hall, remembered as “[holding] several hundred persons, …dancing couples”, the hall was also used as a roller skating rink. George Black’s Brighton Hotel was most well known for his grand dining room, where a guest reports “ I have seen 100 people sit down to dinner in the hotel on a Sunday”. George Black also owned a field across from his hotel and in the 1890’s he became very popular for hosting athletic events and celebrations. The field was the first to host organized events such as “football, cricket, lacrosse, and bicycle racing” as well as horse races. A spectator of the matches recalls his club chartering a CPR train, whose railway was established in Hastings around 1889, for 25 cents a person to take them to the match and it would then wait until the match was over to take them back. During the late 19th century when Hastings Townsite was experiencing high popularity, land was being steadily purchased and people were settling into the dense forest that made up most of Hastings Townsite. When it was resurveyed in 1906 Hastings Townsite was unofficially separated into a northern half, which was the land between the inlet and current Adanac Street, and a southern half, which was closer to 29th Ave. The resurvey of 1906 also named many of the streets, most notably the college and university streets of Cambridge, Mcgill, Oxford, etc. and the mining district streets of Kootenay, Kaslo, Renfrew, etc. Although a resident of Hastings recalls there being in 1908 only seven or eight houses in the north end and only one or two houses in the south and the land between the two halves remaining unoccupied, it shows there was a substantial amount more. On December tenth, 1910, 1’172 property owners in Hastings Townsite voted to officially be incorporated into the city of Vancouver, in doing this they hoped to receive a municipal water supply, sidewalks, street lights, and gravel roads. Hastings Townsite officially joined Vancouver in 1911 and eventually received all the benefits a modern city could offer and was transformed into the park that stands there today. 1935 Vancouver: An Illustrated Chronology. Windsor Publications. 2005 Historical Atlas of Vancouver and the Lower Fraser Valley. Douglas & McIntyre. Vancouver, BC. 1992 Vancouver: A Visual History. Talonbooks. Vancouver, BC. 1988 The First 100 Years: An Illustrated Celebration. Vancouver Board of Parks and Recreation. Vancouver, B.C. *Current Photographs belong to the author.